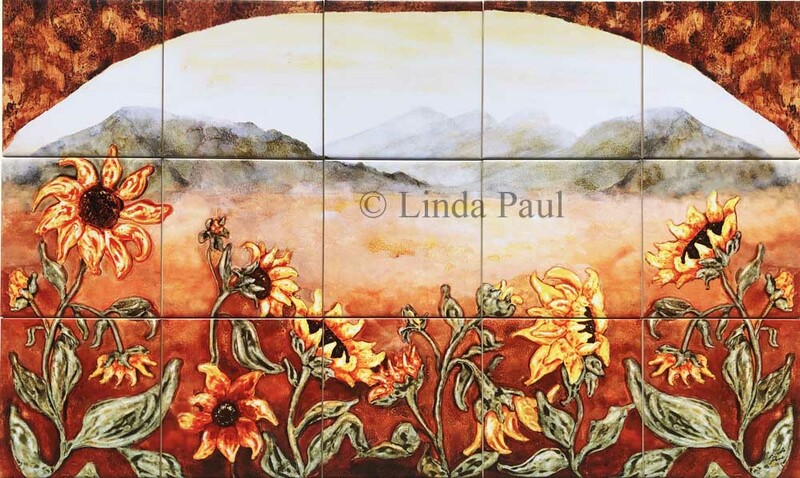 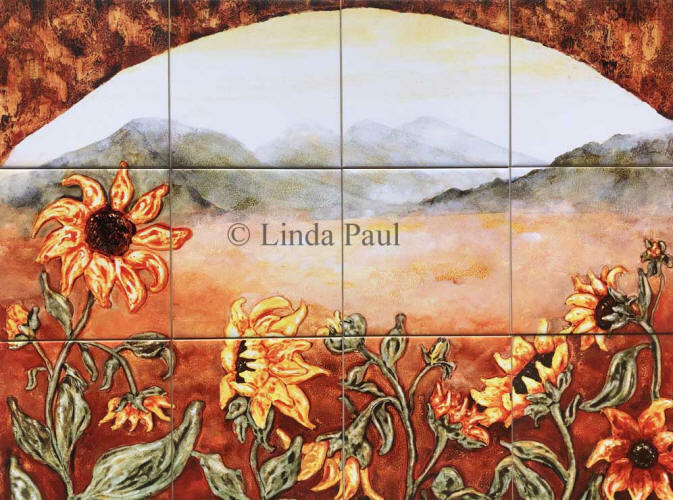 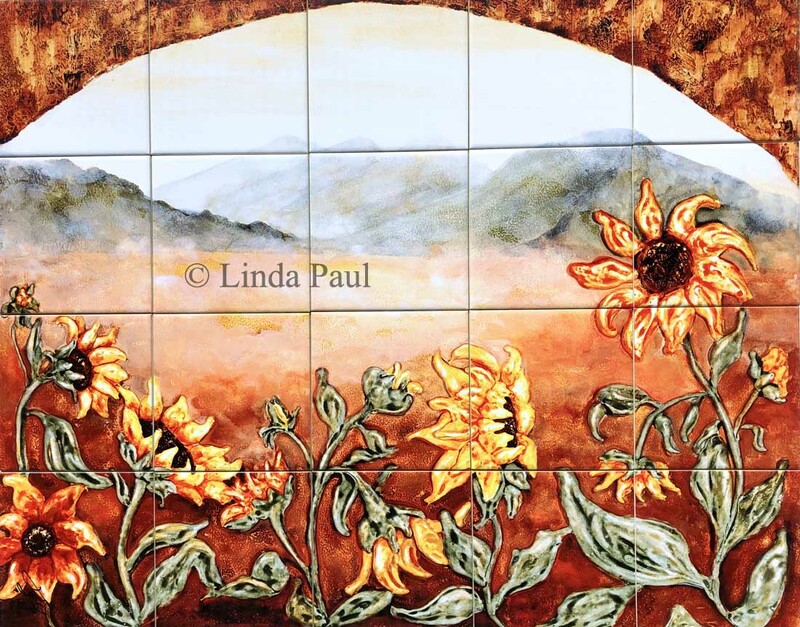 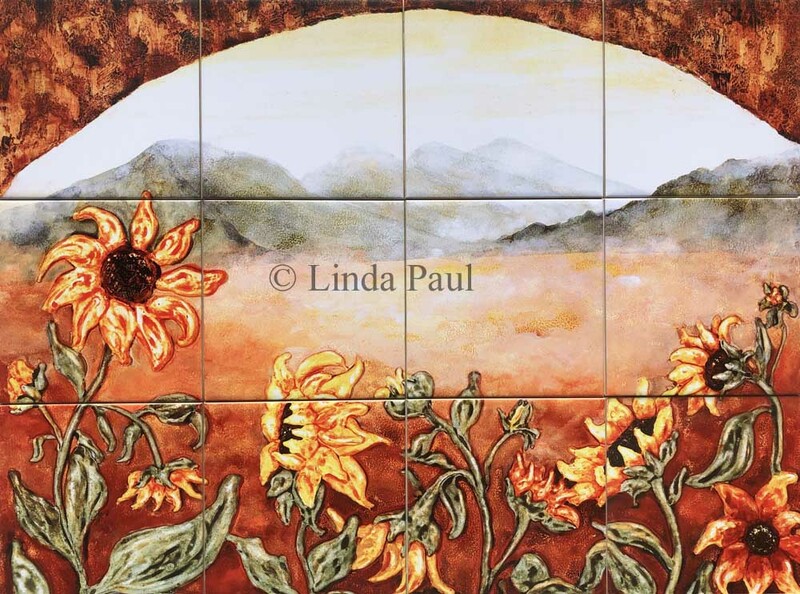 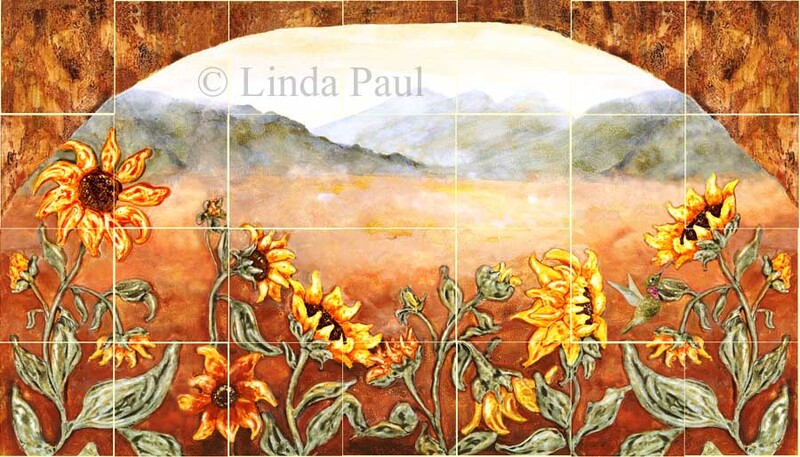 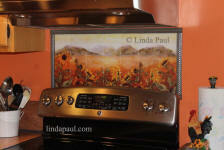 Beautiful western tile mural of sunflowers and landscape of sunflower field and mountains by American Artist Linda Paul. 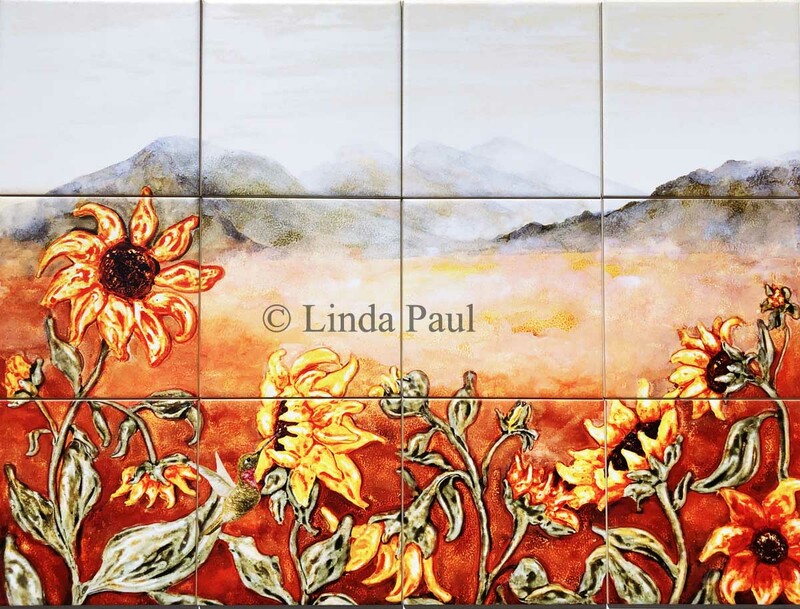 Lovingly hand-crafted in Linda's Colorado art studio. 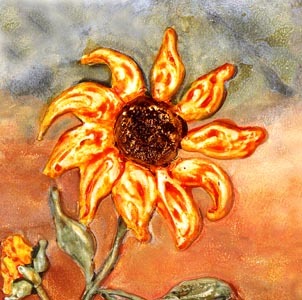 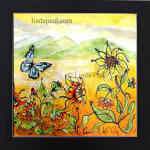 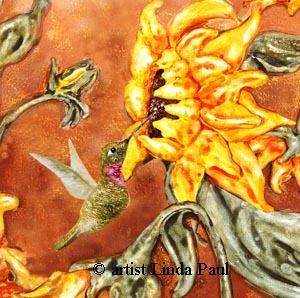 Artist's Inspiration: Sunflower Field was inspired by the artist's view out her studio window. In Colorado, sunflowers are wild and full of life. 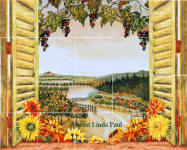 The western Rocky Mountains, in the background, are always inspiring. 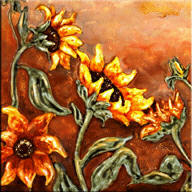 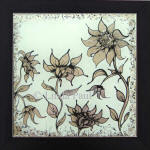 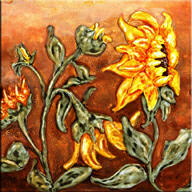 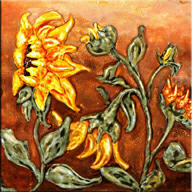 Its perfect for western or sunflower kitchen decor. 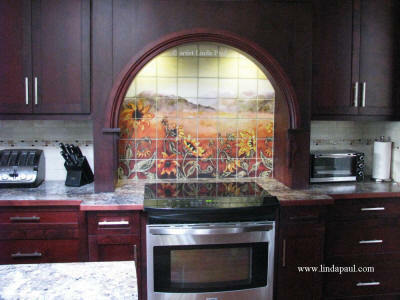 see picture of 30" x 24"
We can also do a version without the top arch and/or we can add a hummingbird to any version. 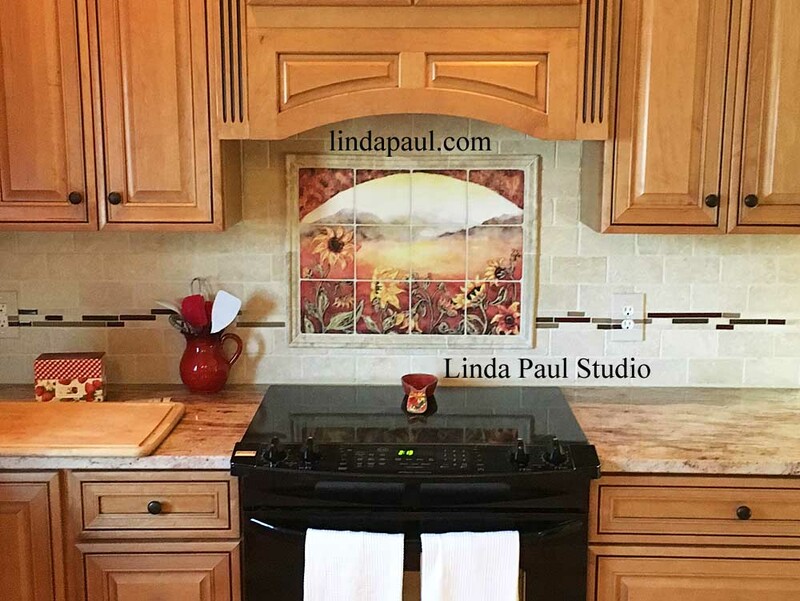 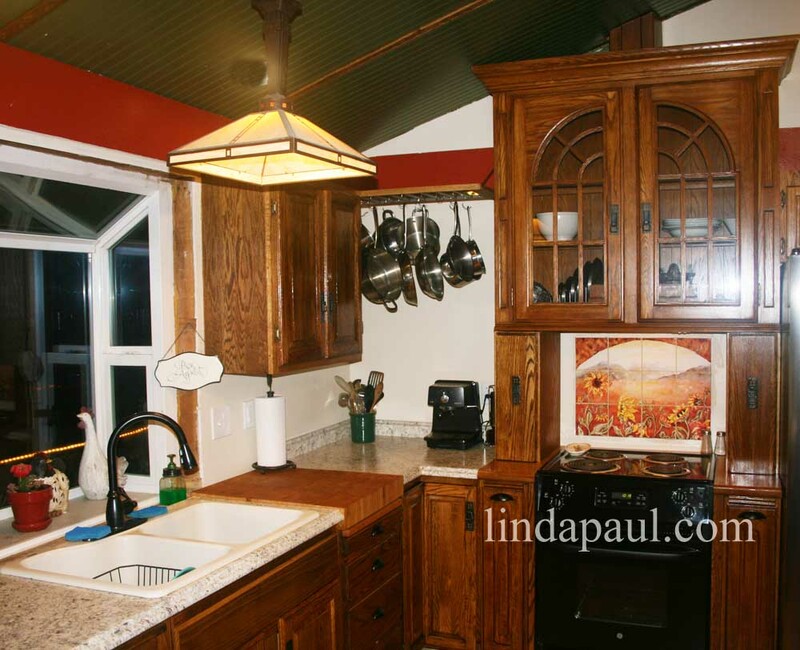 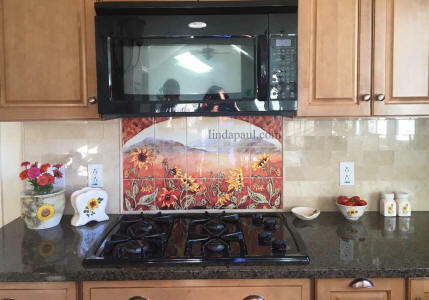 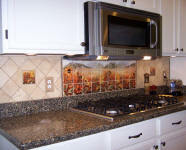 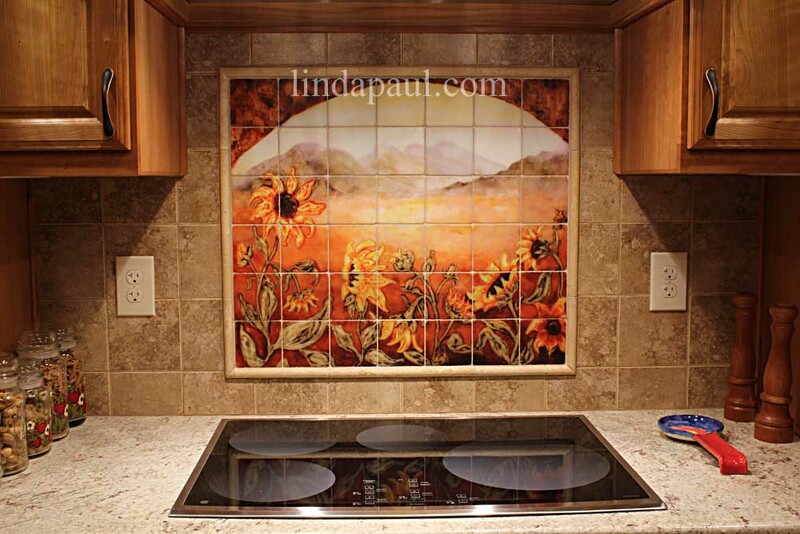 This lovely kitchen features our 24 x 18 Sunflower Field on marble tile. I love it and had many compliments. Extended version sunflowers back splash with subway tile and beautiful cabinets and range, This kitchen decor is contemporary and inviting. 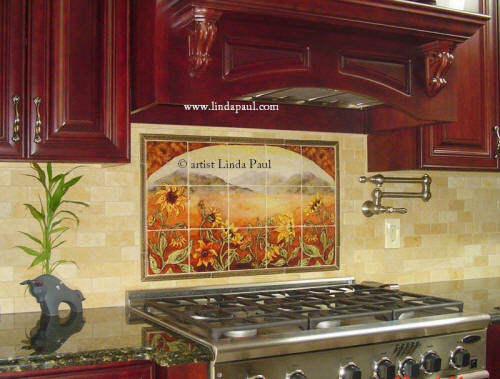 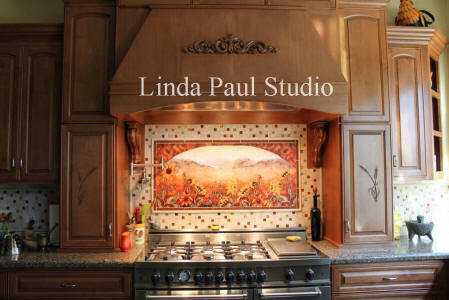 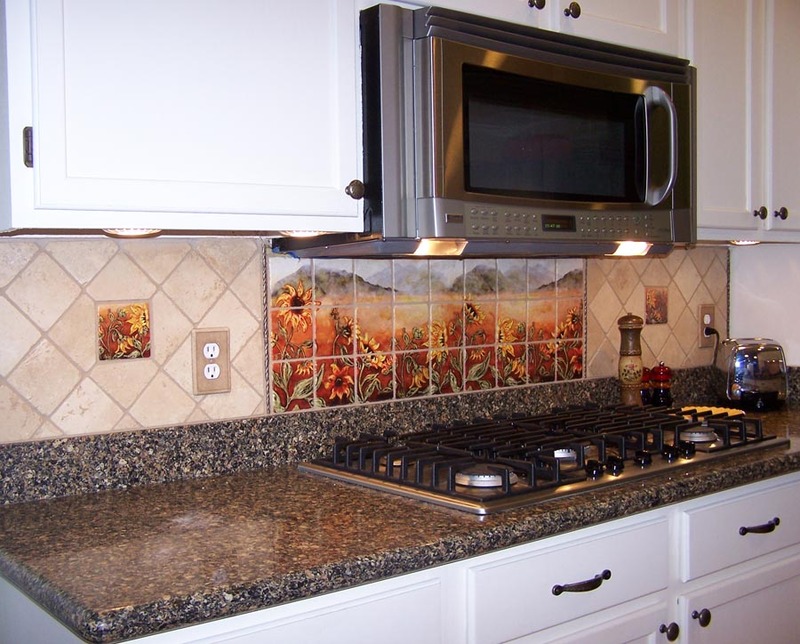 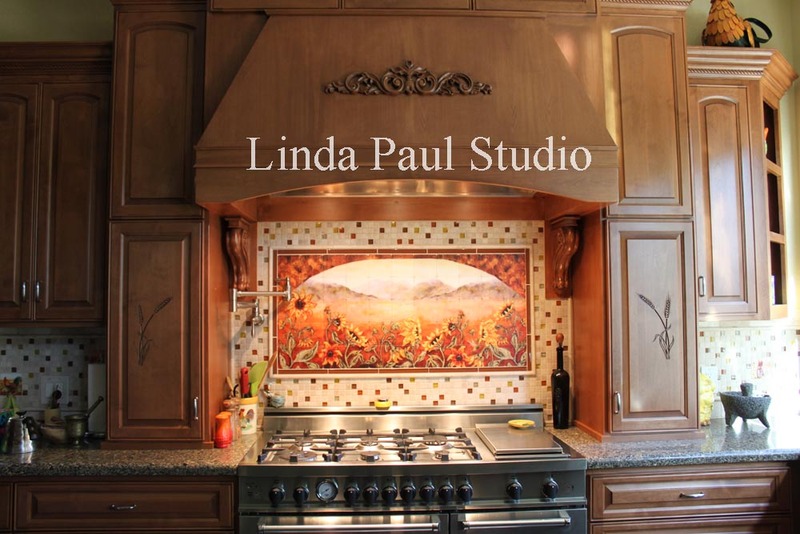 Our Sunflower Field tile backsplash makes this kitchen a happy sunny place. 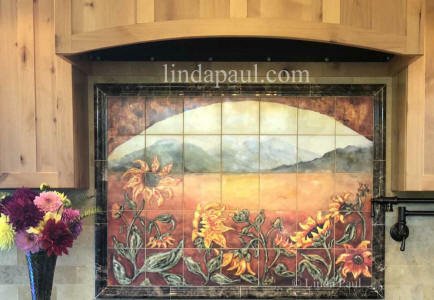 We also love the wheat sheaf carving in the cabinet doors and the glass mosaic tiles surrounding the mural. We can also customize Sunflower Field back splash to fit longer, narrower spaces or create an continuous pattern in any length.